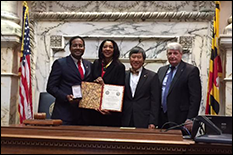 Darryll Pines, Dean of the A. James Clark School of Engineering, became the 25th recipient of the Speaker’s Medallion on March 3, 2015 for outstanding service to the state of Maryland. The medallion was presented by Maryland House of Delegates Speaker Michael Busch. The award is given each year to an individual with a record of service to the state of Maryland. Past recipients include former Baltimore Mayor and Maryland Governor William Donald Schaefer, Under Armour Founder and CEO Kevin Plank, and former University of Maryland President and Chancellor of the University System of Maryland William “Brit” Kirwan. Pines has been Dean and Nariman Farvardin Professor of Aerospace Engineering at the Clark School since January 2009. He first arrived in 1995 as an assistant professor and then served as chair of the Department of Aerospace Engineering from 2006 to 2009. Notable achievements during his time as Dean include obtaining a one-year undergraduate retention rate of 90 percent and a four-year graduation rate of 60 percent. Pines has testified before Congress on STEM education and created the Clark School’s Top 25 Source Schools program for Maryland high schools. Furthermore, he has led an effort as part of the American Society for Engineering Education (ASEE) Deans Council’s K-12 STEM Committee to develop a potential College Board AP Exam in Engineering. Currently, he is the secretary on the Executive Committee of the National GEM Consortium, a national nonprofit providing programming and full fellowships to support increasing untapped domestic human capital at the graduate level in the STEM fields. Pines received his B.S. from the University of California, Berkeley, and his M.S. and Ph.D. from the Massachusetts Institute of Technology.